"Roasted in the oven or on the grill, these onions are simple and tasty. They taste like French onion soup, and smell great. In college I used to put it on the top of my gas stove! Still delicious just the same. Very very easy and loads of flavor." Peel and core onions, then slice halfway through. 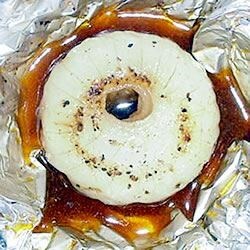 Place onions on sections of aluminum foil large enough to wrap them completely. Place a bouillon cube in the center of each onion; place pat of butter on top. Season with salt, pepper, and paprika. Wrap the onions in foil. Roast in preheated oven for 15 minutes. See how to make a tasty alternative to fried or stewed okra. Very good flavor, but the onions were nowhere near ready in 15 minutes. I had to put them back in for another 15 minutes, so, for me, it was 30 minutes. Worth the effort though. for an added treat, place a slice of swiss cheese on each onion before you remove it from the oven. wait until it has started to melt before removing from the oven. Definately add some crushed garlic, but go easy on the salt as the boullion cube is very salty....Sprinkle with a little fresh grated parmesean cheese and a little paprika at the end. This was a recipe that I had forgotten about ... what a shame. The family LOVED these and welcomed them back on the menu!